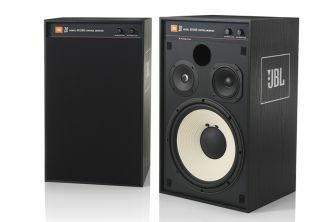 JBL 4312SE 70th anniversary speaker is finally ready | What Hi-Fi? We first reported on JBL's plans for a limited-edition speaker to celebrate its 70th anniversary back in January of this year. The release date of April 2017 has come and gone - it's now on sale next month - and the price has risen a touch (£2500, not the £2300 JBL was originally aiming for). But at last the JBL 4312SE is ready. None of the technical details seem to have changed in the course of this year, though. The 4312SE draws heavily on JBL's iconic 4310/4311/4312 studio monitors of the 70s and 80s, as well as its L100 'Century' domestic speakers - it's a three-way design, with a 12in coated-pulp woofer, 5in coated-pulp midrange driver and a 25mm aluminium/magnesium tweeter with waveguide. Fequency trim controls and a front-facing reflex port are also in place, as is that most 70s of features: black wood-grain finish. And, of course, each 4312SE carries '70th Anniversary' livery and includes a certificate with serial numbers and the signatures of the particular system engineer and assembler who built them.